The explosion in internet shopping has placed very different demands on warehousing and dispatch operations. With next day delivery now standard and same day delivery increasing in popularity, the productivity of dispatch operations is absolutely vital to the success of a business. Historically, single item orders have had to be processed by hand, a time consuming and costly operation that is prone to errors. 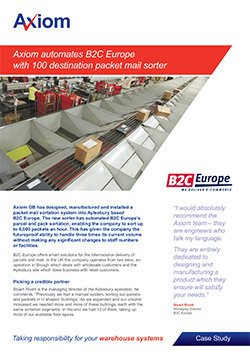 At Axiom, we have designed and engineered a fully automated system to handle single item orders. Product can be scanned in, married up with paperwork and accessories before being bagged, labelled and sorted automatically. 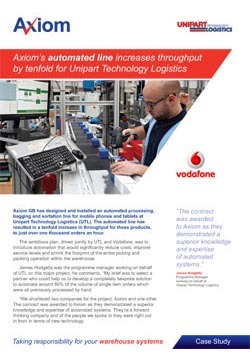 Tailored to your own unique requirements, the system dramatically improves your small order productivity.